'La Maison des Calanques' is a furnished accommodation for 8 to 18 people, built in stone walls of the 19th century, ideally located in the heart of the cove of Callelongue, 30m from the sea, in the heart of the National Park. Calanques, with its typical cabanons, its small marina and its small beach. Accommodation from 8 to 10 people in the House of Calanques (3 rooms) and possibility 6 to 8 additional people in the Cabanon of Calanques adjoining the house (2 rooms). Accommodation for 8 to 10 people, with 4 main rooms on 2 levels, a surface of about 90 m2, including a kitchen and a living room on the ground floor and 3 bedrooms, 2 bathrooms and a toilet. upstairs. Covered and lit terrace, surface about 20 m2, with shower and toilet. For all bookings for 12 people or more, you also have the Cabanon des Calanques: Accommodation for 6 to 8 additional people, adjoining the House of Calanques, with 3 main rooms on 2 levels, with an area of ​​about 70 m2 , including a kitchen-living room and a dining room for 18 people (or large room) on the ground floor and 1 bedroom with shower room and a toilet on the floor. Shaded terrace of about 35 m2 in front of the house. Solarium terrace of about 36 m2 on the back of the house. Patio of about 15 m2 with outdoor shower on the back of the house. Protected since 1975, the Calanque de Callelongue is located in the Calanques National Park and is home to a hundred or so huts, the last vestiges of an old factory of the 19th century, and a small marina where we can still find the last traditional fishing boats. The House of Calanques is located 30 meters from the sea, in the heart of an exceptional protected site, renowned worldwide for climbing, hiking and scuba diving. If you are looking for a villa with land and pool in private, we are sorry we can not accommodate you. By cons, if you are sensitive to the authentic treasures of nature, if you enjoy discovering a unique setting and meeting with a natural and cultural heritage, then you have found some opportunity to live an experience that will mark your memories and your family. The calanque and its privileged vacationers live to the rhythm of the sea and the song of the cicadas, under the deep azure of the sky of Provence ... come to understand why we are Callelonguais since 6 generations! 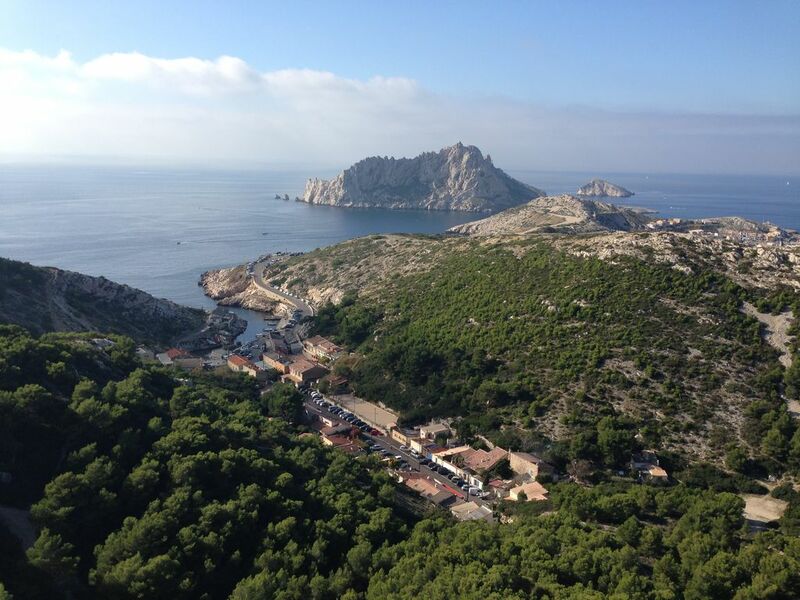 Excursions, hiking and climbing in the mountains of Calanques National Park. Baignages, diving, fishing, walks, private boules court (access for residents Callelongue). boat rental (Port of Pointe Rouge), visit the creeks and islands. Adventure Park of La Campagne Pastre with riding stables and courses acrobranche 4500 m.
Golf seafront, 9 holes, 6 km. Many museums (including the new MUCEM) and tourist sites to visit in Marseille and the surrounding area. Tourist guide available on request. Spacious and comfortable townhouse for a party of 7. Efficient and quiet A/C in living room and bedrooms. 40 meters from the trailhead of the Calenques trail. Host very friendly and helpful. Lots of information available to help discover the region. We wish we could have stayed longer. Beautiful place right in the Calanques National Park. Right on the water of a little inlet of beautiful blue water. Remy was amazing, and answered every single phone call on the first ring. There is a restaurant next door, the Grotto. It was so convenient, and so good, and the people in the restaurant were so nice, that we didn't buy any fish at the market to cook. We ate most of our meals at the restaurant. downstairs space was fine, and three bedrooms upstairs, but we only used two. The place is not new, but it is charming. Great place to start a hike, or play in the water, out of the bustle of the city of Marseilles, and at night, when the day trippers go home, the place is essentially all yours.....we loved it, we loved the quiet, and we loved the space. Thank you Remy. Sorry we missed you in Paris. I forgot to call. La location tres bien equipee et tres propre dans un cadre de reve et qui a permis aux jeunes de courir tous les jours dans ces magnifiques calanques . Nous avons pris 3 aperitifs sur le port .. un delice ; trois d entre nous se sont baignes !! La situation des cabanons est idéale, heureusement car il y a quelques points décevants. Pour 18personnes ce n’est pas adapté, un lit était en fait un matelas gonflable, trois autres des lits d’appoint dans une salle ressemblant plus à un garage et les douches sont en mauvais état. Je pense que pour 14 personnes qui sont habituées à partager des lieux communs cela peut être raisonnable mais réellement pas pour 18. L’accueil est bien, la vaisselle en assez grand nombre. Le cabanon est face aux Calanques, parfait pour des amoureux d’escalade, randonnées et trail. Nous avons tout de même apprécié notre semaine. Le lieu est magnifique.Nous avons trouvé de bonnes information pour visiter Marseille du 24 .02.18.au 3.03.18.Très utile le parking privé .Nous avons apprécié le contact tel ainsi que l'accueil de Virginie. Nous pouvons recommander ce lieu .A+ F G S.
The house is located in the center of the place called "Callelongue", 30 meters from the sea and the small marina. The village of Callelongue benefits during the day of a vehicle access reserved for residents (during the summer period). Restaurants: 20 meters / Restaurant "La Grotte" in Callelongue. Pharmacy: 4 Km / at the place called "La Madrague de Montredon"
Post office: 4 km / at the place called "La Madrague de Montredon"
Supermarkets: 4 Km / 2 Superettes at a place called "La Madrague de Montredon"
Calanques National Park: Callelongue is part of the Calanques National Park. Many hiking trails in the massif (beware traffic in the massif is regulated). Visit the creeks and islands. Equestrian Center: 4,5 km Equestrian Center of the Park of the "Pastré Countryside"
The calanque of Callelongue, in the heart of the classified site of the creeks of Marseilles, shelters a hundred or so huts, last vestiges of a former factory of the 19th century, and a small marina where one finds still the last boats of fishermen traditional. The natural site of the Creeks, Natural Area of ​​Ecological Interest Fauna and Flora Inventory Natural Heritage, has many protected species and on the list of endangered species. The Calanques, classified site since 1975, became the National Park of the Calanques April 18, 2012. The creek and its privileged vacationers live to the rhythm of the sea and the sound of cicadas, under the deep blue sky of Provence ... Come see why we are Callelonguais for 6 generations!